MIS • SION: [mish-uhn] An important assignment carried out for political, religious, or commercial purposes, to accomplish a quest. 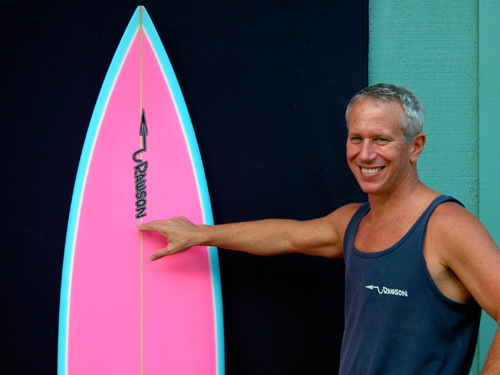 When I started stripping down old Long boards and reshaping them in 1966, it was only to take forward some of my own ideas and build them into actual boards that I could test in my day to day surfing experiences. I have been so blessed with the undying passion to build beautiful boards that worked well in the water, and were equally beautiful to the eye to look at as well. I believe my greater “MISSION” is still that very act: I greatly enjoy my customer’s interaction, and my business is the perfect size for me to continually enjoy bringing my art and craft to all my customers and team riders worldwide. I am extremely grateful to all who have supported my passion and 49 years of surfboard manufacturing experience, to do just that!